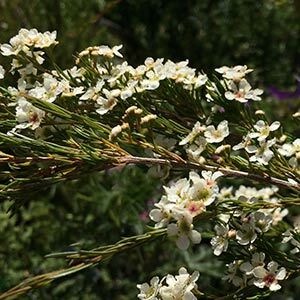 A tallish twiggy shrub Baeckea virgata is grown for the foliage as well as for the masses of white flowers that cover the plant through summer. Foliage is a mid to deep green with new growth in spring displaying a bronze colour. Although this is tall plant, it does have a natural weeping habit and mature plants look graceful as the branches droop gently. The better the soil and the more moisture, the bigger Baeckea virgata will grow. in good conditions a height of 3m + is possible. Baeckea virgata seems to having a name change, also seen as Babingtonia bidwillii as well as most recently Sannantha virgata, however we will stick to Baeckea until this is cleared up in nurseries. In good conditions it can be be judiciously pruned into a small tree of around 4m in height. This is a fairly versatile plant in terms of soil, it will grow in poor soils as well as moist soils, however for best growth a humus rich soil that is well drained is best. Mulch around plants to maintain moisture. New plants can be watered in with a liquid seaweed fertiliser. Baeckea virgata can be lightly pruned after flowering to maintain a more compact growth habit if required.